The ongoing attention to corporate social responsibility reporting (CSRR) research is visible with most of the research focus on cross-sectional analysis and from the perspective of developed countries. Drawing upon the top publicly listed companies in Malaysia (a developing country’s perspective), this study contributes to the extant CSRR literature by means of a longitudinal analysis of the influence of ownership structure and company characteristics on the quality of CSRR in both voluntary (year 2005) and mandatory (year 2009) CSRR regimes. The results from the regression analyses showed that companies with a higher proportion of family (government) ownership reported lower (higher) quality of CSRR in both the voluntary and mandatory reporting regimes. Companies with a higher proportion of foreign ownership disclosed a significantly greater quality of CSRR in the mandatory CSRR regime, yet no association was found between foreign ownership and CSRR quality during the voluntary CSRR regime. 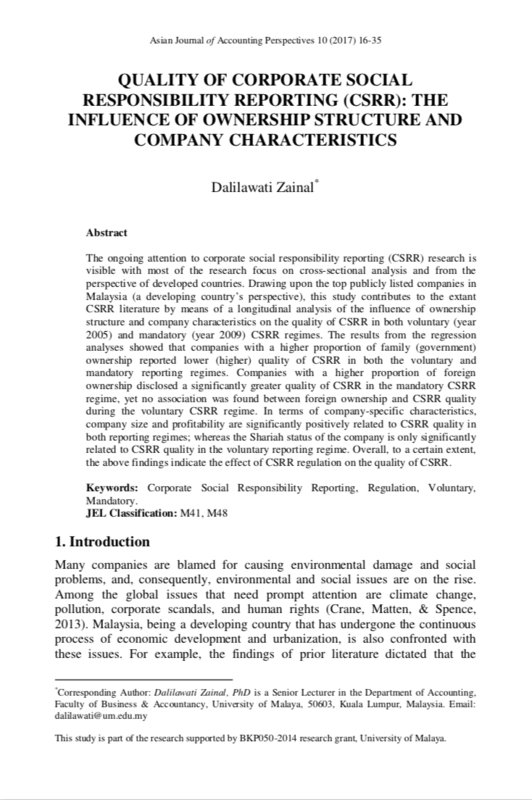 In terms of company-specific characteristics, company size and profitability are significantly positively related to CSRR quality in both reporting regimes; whereas the Shariah status of the company is only significantly related to CSRR quality in the voluntary reporting regime. Overall, to a certain extent, the above findings indicate the effect of CSRR regulation on the quality of CSRR. ZAINAL, Dalilawati. Quality of Corporate Social Responsibility Reporting (CSRR): The Influence of Ownership Structure and Company Character. Asian Journal of Accounting Perspectives, [S.l. ], v. 10, n. 1, p. 16-35, dec. 2017. ISSN 0128-0384. Available at: <https://ajap.um.edu.my/article/view/11277>. Date accessed: 20 apr. 2019.